This Spaniel type is highly athletic and needs plenty of support to keep up energy levels without increasing weight. Whole proteins encourage proper muscle tone and keep your Spaniel’s overall body mass at the right place. Brittany Spaniels are cherished sports dogs with agile bodies and quick minds. They’re highly athletic and have been used in the past as gun dogs with excellent results. Now, they make great family dogs with loyal temperaments and excellent, intelligent minds. Brittany dogs require dense nutrition that won’t pack on pounds but will still support their muscle tone and bone structure. Making sure to feed them the right kind of food allows you to enjoy their wonderful personalities for many years. Let’s see what it’s going to take to keep your Brittany Spaniel happy and healthy for many years by breaking down exactly what they need and how to get it. Brittany Spaniels are bright, so a good quality food prevents the dulling that can happen when any animal (including humans) eat terrible quality foods. You may save money in the short-term buying bargain foods, but you’ll end up at the vet’s office more than you’d like. Prevent this by serving your Brittany only the highest quality foods that can provide energy all day and encourage proper growth. Health begins with the diet, and Brittany dogs can be more susceptible to diet-related issues than some other breeds. Brittany dogs are reasonably healthy dogs, but there are a few conditions to watch out for. Diet can help alleviate the symptoms from most of these conditions, so it’s important to consider them when you’re choosing food. Athletic dog breeds are all susceptible to this genetic condition, so Brittany dogs should be watched carefully for the signs. It happens when the hip socket forms correctly, making dogs with the condition more likely to pop the joint out of place during heavy exercise or with excess weight. Keeping your Brittany at the ideal weight can alleviate the symptoms, as can proper protein to maintain muscle tone and support for those joints. This condition is also genetic and will require medication to help your Brittany maintain a quality of life. However, a proper diet helps support thyroid function by keeping your Brittany at the right weight and preventing blood sugar spikes. Gluten-Free diets may be helpful here. This Spaniel variety is a lithe, athletic breed, so even a small bit of extra weight could have detrimental effects on its health. It can stress joints and bones, cause issues with genetic conditions such as thyroid issues, and prevent your Spaniel from participating in life fully. Controlling your Spaniel’s weight, especially in the senior years, is a critical part of feeding. Complete proteins should be the first ingredient in your dog food to ensure that muscle tone is supported, and energy levels are kept steady. Mix it with quality complex carbohydrates to prevent blood sugar spikes and your Brittany will have energy all day long. Fruits and veggies provide vitamin and minerals to support the immune system plus provide prebiotics for better digestion. Good fiber sources help keep weight under control and also help your Brittany to feel full after eating. Essential fatty acids support brain health and keep the skin from being inflamed. Make sure the food has plenty of glucosamine and chondroitin whether your Brittany is a senior or not to help alleviate the long-term effects of joint aging. Cheap fillers such as corn and soy can cause allergic reactions in sensitive dogs and cause unnecessary weight gain. They have no nutritional value and serve only to bring down the cost of the food itself. They shouldn’t appear anywhere in the ingredients list. Other ingredients to avoid are artificial colors and flavors, which provide no nutritional value and by-product meals which make it difficult to identify what meat is actually in the foods. 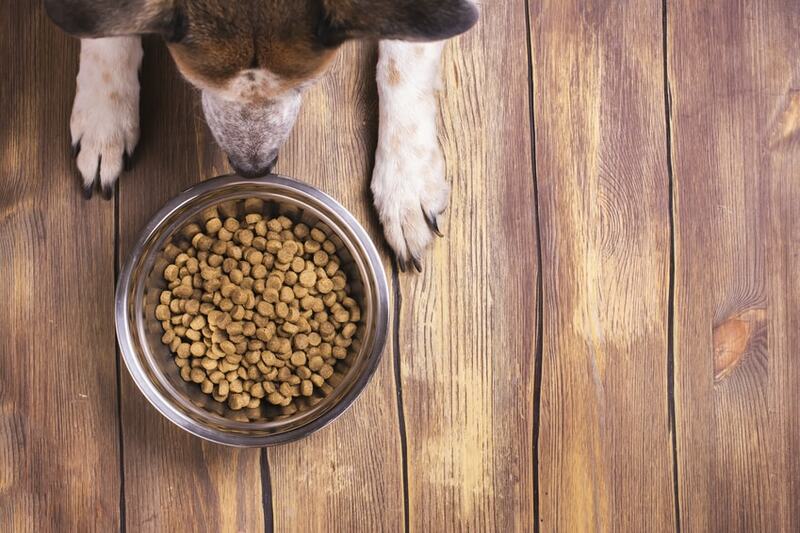 Carefully controlling your dog’s diet keeps health at its best, so avoid these ingredients as well. Recently, a possible link was uncovered between a diet high in potatoes, peas, and legumes and a condition known as Canine Dilated Cardiomyopathy. It causes the walls of the heart to enlarge and weaken. Since we aren’t sure of the real connection just yet, talk with your vet about what to do and try to avoid foods that list these ingredients in the first three positions. We see these brands all the time on shelves, and although they do offer a bargain, you’re likely ruining your pet’s health in the long run. You may see them on the shelves, but we recommend running far away. Ol Roy: Walmart’s dog food brand is high on quantity but not much else. It does feature one of the lowest costs per ounce out there, but there’s also nothing but red flag ingredients such as soy and corn. Avoid the temptation to save money with this one. Alpo: We can’t even remember how many times this brand has been recalled due to quality control issues. Plus, it uses cheap fillers and poor sources of meat and protein to bring down the cost. Your dog may like the taste, but you won’t like the result. Kibbles N Bits: This old school food is really common, but it has corn, soy, artificial flavors, artificial ingredients, and by-product meals. Just avoid it despite how easy it is to find everywhere from big box stores to your corner gas station market. Puppies: Puppies will change quite a bit over their maturation, but generally they start out with three to four meals per day. Feeding portions depend on the food and your vet’s advice. Adults: Adults receive around two cups of food per day divided into two meals. Check with your vet and the recommended serving size of your particular food for specific portion sizes. Seniors: As your Brittany ages, your vet may adjust portion sizes a bit to account for periods of inactivity and weight gain. It’s critical here to maintain a proper weight to avoid serious issues. Your Brittany needs plenty of protein and carbs for energy, but weight control is a critical part of this process. To maintain athletic tone and mental acuity, you should look for foods high in protein and fatty acids while low in empty calories. Instinct by Nature’s Variety uses real raw food, freeze-dried for better storage. It’s mixed in with premium kibble to provide high-quality protein. Essential fatty acids support skin health while fruits and veggies give your Brittany essential vitamins and antioxidants to promote overall health and well being. Instinct By Nature’s Variety mimics your Brittany’s canine ancestral diet through raw meat bits and plenty of fruits and veggies. The company’s recipes help your companion maintain excellent overall health and encourage even picky Spaniels to eat regularly. Blue Buffalo is an excellent affordable alternative to higher-end foods without sacrificing nutrition. It features high-quality protein from a lean source that also provides plenty of fatty acids to support brain and skin health. It’s grain free and contains no empty fillers that can cause allergic reactions. Blue Buffalo began with a quest to provide the best nutrition to a single dog, Blue. That Airedale Terrier inspired an entire range of foods that offer high-quality meals at more affordable prices to keep your Brittany in top shape. Ollie creates fully cooked meals using human grade ingredients to help pet owners balance the nutrition of raw food with the ease of kibble. Healthy Turkey feast uses whole turkey for quality protein plus whole fruits and veggies for essential vitamins and antioxidants. The meals should satisfy even your pickiest companion. Ollie prides itself in making high-quality meals more accessible to pet owners. They use vet recommendations to create nutrient-dense recipes to be delivered to your door ready to serve or to refrigerate for later. It’s an excellent option if you’ve ever wanted to serve raw food but aren’t prepared for the hassle. Puppies change a lot during their young years, so feeding them will be a changing game. Your veterinarian will probably alter the feeding schedule and portions several times during the puppy years, so be ready for the change. American Journey’s puppy formula provides all the building blocks your Brittany will need to grow healthy and active without stressing joints and bone structure. Whole proteins and a complex carbohydrate blend gives your puppy energy and encourages muscle tone. It’s grain free and contains no cheap fillers that can trigger sensitivities or stimulate rapid growth and weight gain. American Journey uses ingredients from trusted suppliers only, creating recipes designed to help your dog build health and wellness from the very beginning. Premium proteins, whole fruits and veggies, and plenty of vitamins give your Brittany pup the best beginnings. Merrick’s grain free wet food can help your picky puppy eat without triggering food sensitivities. It uses whole chicken for a quality protein source and contains plenty of fiber and moisture to encourage proper digestion and weight. It’s suitable for both adding to kibble and as a meal by itself. Merrick uses whole, locally sourced ingredients to give puppies the best start in life. It’s a smaller company and creates each recipe in its own test kitchens before release to provide the best recipes for your Brittany. This is a critical time for your Brittany. Maintaining proper weight in the face of declining activity levels is mission number one. Plus, seniors can benefit from supplements for joint health and fatty acids to keep their minds sharp. Now Fresh’s recipe uses balanced proteins and carbohydrates to help maintain a healthy weight. Complete proteins help support muscle tone while glucosamine and chondroitin can provide better cushioning for aging joints. Fatty acids are excellent for brain health and keeping the skin clear of inflammation. Now Fresh is committed to providing your pet with quality kibble that can help transform those golden years into quality time and wellbeing. Their recipes balance proteins and carbs to prevent unnecessary weight gain while whole fruits and veggies complete your Brittany’s diet. They’re committed to holistic nutrition and believe that much of your pet’s health starts with the proper food. Nutro’s senior formula uses rich lamb as a source of whole protein and fat suitable for aging seniors. Rice provides lasting energy without packing on the pounds. It uses a limited ingredient formula to alleviate sensitivities and help your senior Brittany digest food with fewer problems. Plus, glucosamine and chondroitin support aging joints while fatty acids promote brain health. Nutro provides plenty of quality kibble to help your senior maintain a quality of life fitting for your best friend. The company used to be available only in specialty stores but has expanded in the belief that all pet owners deserve the chance to provide excellent meals for their dogs, no matter the life stage. Your Brittany is a highly athletic, highly intelligent dog that loves nothing more than to run until it’s spent and then pass out next to a favorite family member for a good, long nap. Feeding your Brittany quality food helps supports that energy and prevent stressing the joints and bone structure, especially later in life. As your Brittany ages, maintaining proper weight is priority number one and critical to maintaining a good quality of life. Our chosen foods use only high-quality ingredients for better nutrition so you can stop worrying about how your Brittany is aging and start worrying about how to burn off all that extra energy. Put your time into something you both love instead of constant vet visits and enjoy your Brittany from puppyhood right into the twilight years. For such a curious dog, the one thing you should never worry about is the diet.